Jessie had always wanted a pet bird. She loved the way little birds hopped around and their chirpy songs. She had begged her mom to get her one for her birthday, but her mom said they were noisy and carried germs and it was a horror to clean out their cages. Jessie promised to do all the work, but her mom was having none of it. It was a small satisfaction that she also said a firm no to Jason having a pet snake, but Jessie still felt that her mother was being unfairly biased. She was playing in the yard when she first saw it. A sweet little robin was sitting on the fence, its little red belly standing out against the rest of the soft brown. It looked her right in the eye, and Jessie would have sworn she saw a twinkle there. It didn’t fly away when she walked slowly closer. It just gave a little hop and landed back where it had been. Jessie walked right up to the fence, barely daring to breath. Slowly, she held out her hand. 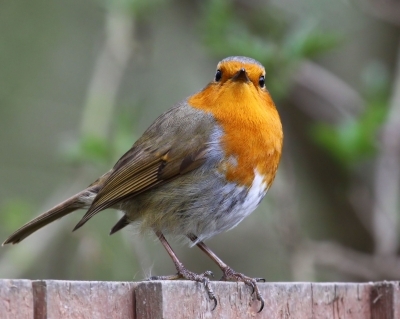 The robin cocked its head to one side and held its ground. The robin ruffled its feathers and stared back at her. The little bird hopped again, and Jessie held her breath. Then it hopped right into her hand. It was so small that it fit perfectly in her palm. Jessie felt happier than she’d ever felt. Slowly, slowly, and very carefully, Jessie walked into the house. Fortunately, her mom was in the basement folding laundry. Jessie carried the robin into her room. After she had shut the door, she set it carefully on the bedpost. The robin hopped up and down, then fluttered from place to place in her room, exploring. It gave a little twitter, not loud enough to give them away but just enough to show that it was happy. Jessie laughed. This was the best day ever. At the dinner table that night, Jessie couldn’t stop grinning. She ate all her food and only at the last minute remembered to complain about the green beans so her mom wouldn’t get suspicious. Then when no one was looking, she put a few in her pocket to feed to the robin. Jason started in with some story about how his friend Jimmy had been attacked by a cardinal. He claimed that it landed right on Jimmy’s head and pecked his ear until it bled. Jessie rolled her eyes. Jason was such a liar. Just last week he had eaten the last four cookies in the jar and then made up a story about a homeless guy coming by and begging for food. It was pathetic. Back in her room that night, Jessie fed green beans to the robin. It twittered again and then sat perfectly still while she kissed it goodnight. Jessie snuggled into her bed and felt the robin snuggle down on the pillow next to her. At school on Monday, Jessie felt like she was carrying around the world’s best secret. Not only did she have a pet bird, she had caught it herself and it ate right out of her hand and slept on her pillow. She wanted to tell all of her friends, but she didn’t think any of them would believe her. Jessie had always disliked Madison Snively, but now she positively despised her. Every day that week, Jessie rushed home from school to check on the robin. It was always waiting for her, snuggled up on her bed or hopping around her dresser. It always greeted her with a happy twitter. Jessie would spend the afternoon in her room, feeding the robin seeds or lettuce and doing her homework with it perched on her shoulder. She still hadn’t told anyone about it. Four more girls at school had talked about their new pet birds. Apparently getting a bird was the newest fad, like silly bands that you had to feed and clean up after. Jessie didn’t like feeling like part of a fad. Her robin wasn’t like that. He was a friend, not some pet she would drop when it was no longer new and cool. On Friday, she bumped into Jason’s friend Jimmy in the hallway. He had a big bandage over one ear. She remembered Jason’s ridiculous story about the cardinal and wondered what had really happened to Jimmy. That day on the way home from school she passed a huge raven sitting on a mailbox. It cawed loudly and obnoxiously to her, and Jessie hurried by as quickly as she could. Creepy old thing. Saturday morning was sunny. Jessie saw that robin was sitting at the window in her room, staring outside. She thought maybe he wanted to go out and fly around for a while. She hoped he didn’t want to leave forever. She wondered if she should let him out for some air. If she did, would she ever see him again? Maybe she should just keep him locked up safe inside. After a while she decided that was cruel. She opened the window. The robin flew out. Jessie ran downstairs and out into the back yard. She watched as the robin fluttered up into the trees. She heard the twittering of many birds, and then a whole flock of them swooped up out off the trees and off into the distance. Jessie almost cried. Her robin had gone with the other birds. She would probably never see him again. No one was in the woods that day. No one saw the great flocks of tiny birds that swooped in and landed on every available branch. No one heard the echoing rustles and twitters and warbles as they waited. Several people noticed the circling hawks. Men and women stopped to comment on how they had never seen so many in one place before. A few children ran inside, telling their unbelieving parents that they had seen owls and eagles. One old man counted thirteen ravens fly past his front porch. He went inside and locked the door. It was a day for bad luck. No one was in the woods that day. No one saw the hunting birds descend or the songbirds launch their attacks. No one saw owls fall under the weight of dozens of starlings. No one saw an eagle taken down by a hundred finches. No one walked under the trees where ravens’ bodies littered the ground and feathers drifted down like fall leaves. The next day, the sky was clear of birds of prey. No one thought anything of it. Jessie almost cried with relief and joy when her robin came home early the next morning. She woke up and there he was, sitting outside her window. She opened the window and let him in, noticing that his wing was a little crooked and there was some dried blood on his feathers. Jessie spent the day taking care of the poor sweet robin, never imagining that all across town little birds were coming home to their new families similarly injured and being cared for just as she cared for her robin. That night, Jessie once again shared her pillow with the little robin. She fell asleep happy and never once gave a thought to how sharp its little beak was or how quickly it’s tiny claws could move. It was the last time she would overlook such important things. Image courtesy of Paul Brentnall at freedigitalphotos.net.